In the ancient world, if you wanted to sign something you used a seal. They came in various shapes and sizes – stamps, seals, signet rings – but the general idea was always the same: you had a small object that you could press into clay or wax to mark it with a design unique to you – just like a signature. This could be used in various ways. In the Near East, for example, legal decisions or transactions might be recorded on a tablet, and then all the witnesses would press their seals into the clay next to their names. In other cases it could function as an official lock – a door or container-lid could have a blob of clay pressed over the join and this would be marked with an official’s seal. If the clay was broken – or if it had been replaced with one without the seal – then people would know it had been tampered with. Here’s one of the most famous examples of this: the unbroken clay seal on the tomb of Tutankhamun, photographed before it was opened in 1922. Making and baking inscriptions – and the CREWSmas party! Term-time has recently finished here, and the CREWS project team has been taking part in some rather jolly end-of-term activities. The first was the final session of the ‘Linear A self-help group’, a series of seminars we have been running where a number of colleagues working on Linear A or related scripts have been presenting their work and discussing their ideas. For the final meeting, we decided to have a practical session, and to try making our own inscriptions using modelling clay. You also can read about it on our colleague Anna Judson’s blog HERE. What are Linear A and Linear B? 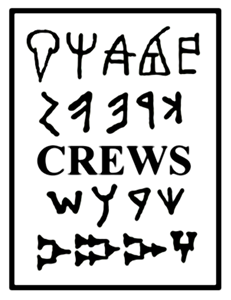 Linear A was used around the 19th-15th centuries BC, in Crete and some of the islands, to write an unknown language that we label ‘Minoan’ (we know the values of many signs, but still do not understand the language). Linear B was used around the 15th-13th centuries BC, in Crete and on the Greek mainland, to write an early form of Greek. Why bother trying to make our own inscriptions? Well, actually there are still a lot of unanswered questions about the production of clay tablets in the ancient Aegean. How did the scribes achieve such detail in the more complex signs? What did they use to write with? How did they create the flat surface for writing on? Why are Linear B ‘palmleaf’ tablets (i.e. small elongated ones that can be held in the palm of the hand) curved on the back but flat on the top? We started off the session with an illuminating presentation by PhD student Ester Salgarella on some of these problems, and then we set about trying to answer some of them through a practical attempt at making our own tablets.